Frinterns for Life: Arlice Marionneaux, an American Conservation Experience (ACE) intern, and Andrianna Dowell, an intern from the Latino Heritage Internship Program (LHIP), became the best of friends after their respective internships brought them together as part of a multi-agency team that included National Park Service (NPS) personnel from Biscayne National Park, NPS’s Submerged Resources Center, National Oceanic and Atmospheric Association, University of Miami’s Rosentiel School for Marine and Atmospheric Science, Diving With a Purpose (DWP), Youth Diving With a Purpose (YDWP), and Woods Hole Oceanographic Institution. 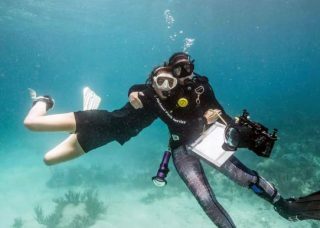 The two women are shown embracing during a dive with a diverse group of high school students who were practicing mapping a suspected sunken pirate slave ship. The future of archaeology lies in the generations to come. Educating children about archaeology and its impact on the development of history gives our children a better understanding of how their histories are created. This youth program was developed to educate youth about the fundamentals of archaeological methods with the goal of promoting the development of archaeological literate citizens. This is citizens who understand basic archaeological terminology and process, citizens who have a general understanding of the importance of heritage (their heritage) preservation, and citizens who understand their stake in their histories. Gjoa Haven team members starting to excavate a 4×5 ft hole in 6-ft deep ice for Spring ROV operation on HMS Terror shipwreck, while Parks Canada underwater archaeologists are setting up camp. 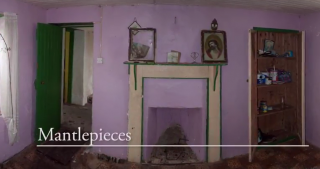 Mantelpieces is a personal story of the memories of two former islanders of the now abandoned village on Inishark, Ireland. Their homes and childhoods are remembered here, visiting this village since the last of the residents left in 1960. This site has been the focus of archeologist Ian Kuijt and filmmaker William Donaruma’s work over the past six years and these stories are part of a larger work in progress. St Colman’s Abbey, located on eastern Inishbofin, Ireland, is a well preserved 15th century late medieval church built on a 7th century foundation. 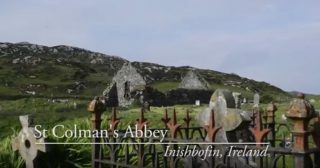 This video is an example of the collection of embedded films in the book, Island Places Island Lives, whereby the viewer can now take a tour through and above the sites with additional information beyond the text and photograph. 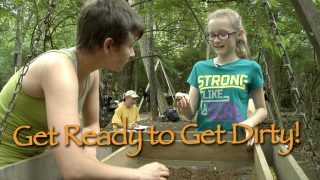 In the video, “Get Ready to Get Dirty!”, Western Michigan University archaeologists showcase their archaeology summer camp program for middle school students. Through firsthand accounts, viewers learn about the excitement and enthusiasm that middle schoolers experience as they conduct archaeology in real time in conjunction with the faculty, staff, and university students of WMU’s annual archaeological field school, now in its 43rd year. Heritage Management Scouts (HMS) Florida: A Citize..
Heritage Monitoring Scouts (HMS Florida) is a public engagement program of the Florida Public Archaeology Network (FPAN) focused on tracking changes to archaeological sites at risk, particularly those impacted by climate change in the form of erosion and sea level rise. 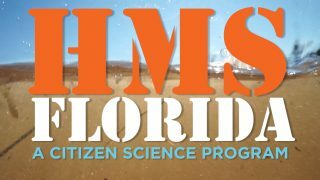 This video highlights an HMS Florida training conducted at Camp Helen State Park that provided citizen scientists a unique opportunity to help archaeologists document sites before they are lost to the effects of climate change.